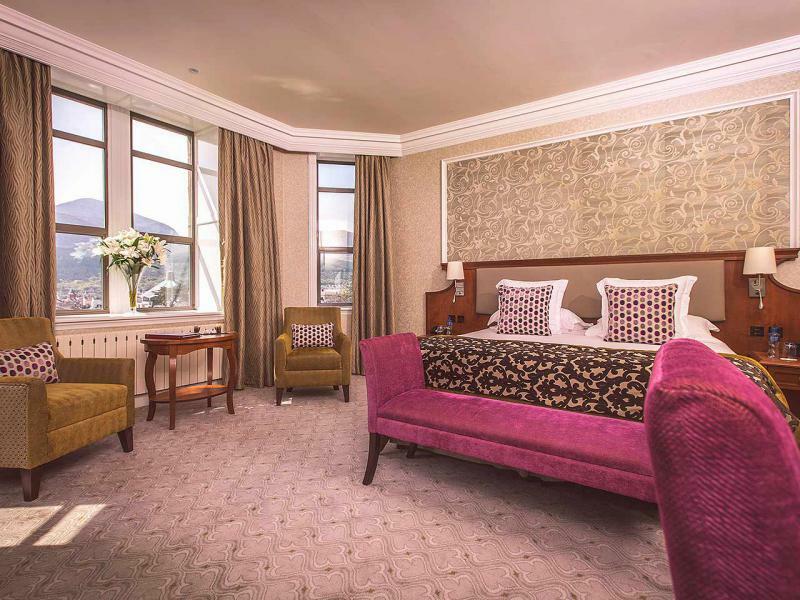 Our first impression of the Slieve Donard Resort & Spa was absolutely stunning, the hotel is full of Victorian splendour and sits in six acres of private grounds, and well worth our easy 45 minute ride from Belfast City Airport. The hotel has 180 bedrooms which include 100 new executive rooms, six suites and a fantastic spa. As you would expect with such an impressive hotel the wedding facilities are any brides dream! With the Royal County Down Links Golf Course, Coastline, and Mountains of Mourne on the doorstep we didn’t need to travel far for comfort and enjoyment. There is so much to do in the area the Tollymore Forest park, Silent Valley, Castlewellan park and Mulough Bay Nature Reserve are but a few options. 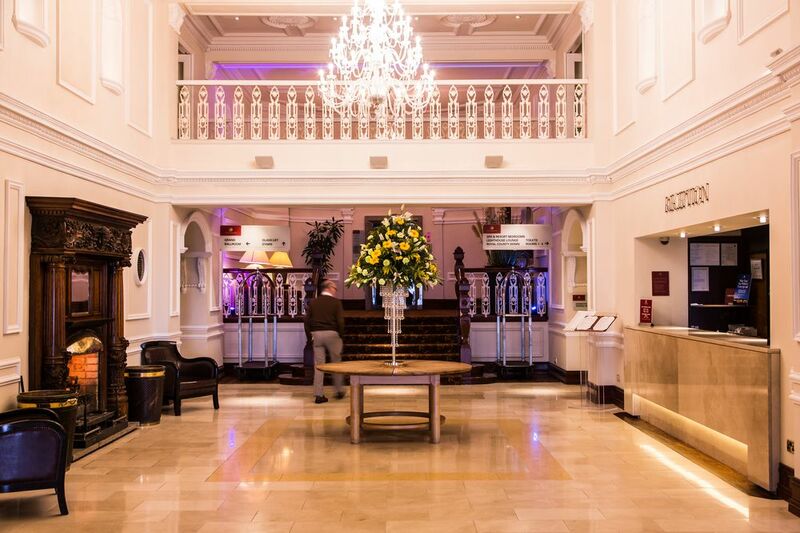 As we entered the hotel we found the reception impressive with luxe marble floors, sparkling chandeliers, comfy seating and a classic mezzanine balcony giving us sneaking peaks of the 2nd floor. We were greeted promptly with a warm Irish welcoming and shown to our room following a quick and easy check-in. Our Executive bedroom was huge and spacious with the famous King Koll ‘cloud bed’ taking pride of place. Décor was stylish with gold and pink soft furnishing, The sofa & chair were placed ideally by the window which afforded views over the beautiful bay. 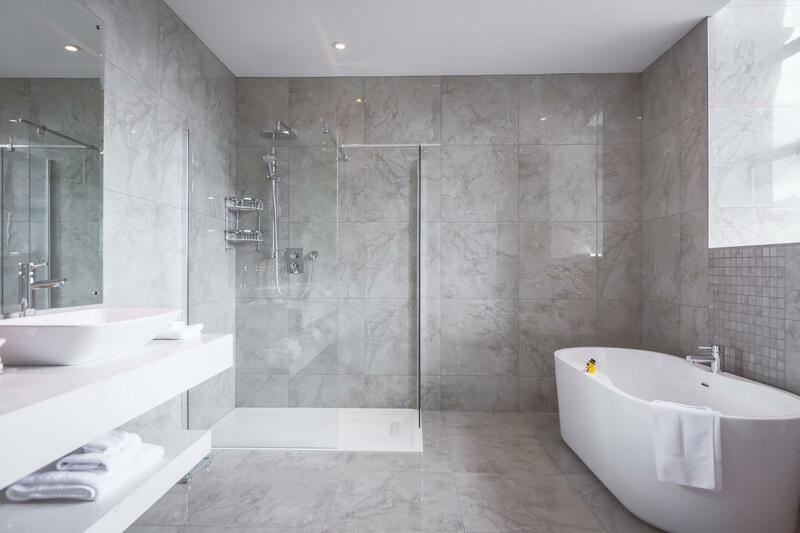 The bathroom felt luxurious & modern; large in size with an amazing shower, double sinks and free standing bath. The overall décor was decked out in black & white tiles, soft towels and complementary toiletries from the ESPA. THE SPA The mindful massage we had was so relaxing and our therapist explained in so much detail. My therapist used the Espa aroma massage oil which is blended with a super relaxing chamomile and lavender. 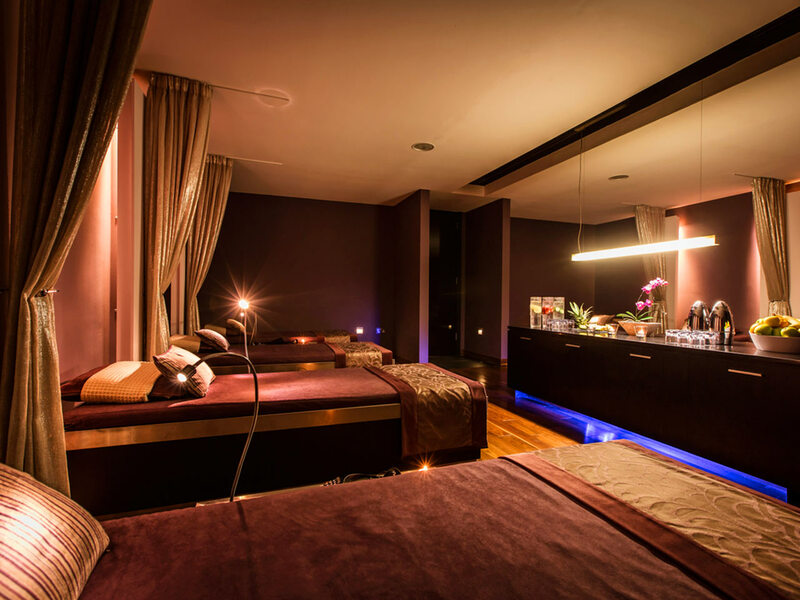 Following my treatment I was shown to the relaxation room comfy beds, mood lighting and drinks on hand a perfect end to an amazing experience. The spa pool area was lovely and featured floor to ceiling windows overlooking the whole of the bay and the sand dunes. Relaxation beds were placed well some overlooking the view, mood lighting was great a contrast of light and dark, the pool itself was large with mosaic tiles. We also used the Jacuzzi, Amethyst Steam Room and Sauna. We dinned in the Oak Restaurant which was fine dining at its’ best! Extensive choices include starters of Bushmills Whisky & Dill Cured Organic Salmon Horseradish Cream, and Caper Berry, Lemon Oil, and mains of Classic Paupiettes of Lemon Sole Crab and Parma Ham, White Wine Velouté with Pickled Grapes which was a particular favourite while the Seasonal Spiced Apple Pudding Creamy Vanilla Custard, Glastry Farm Ice cream is a must! We stayed 2 nights at this beautiful hotel and made the most of the facilities and surrounding beach and country side. We also took a tour of Belfast with all the interesting attractions associated with this city including the docks where the Titanic was built. This is a fabulous hotel and a highly recommended location. 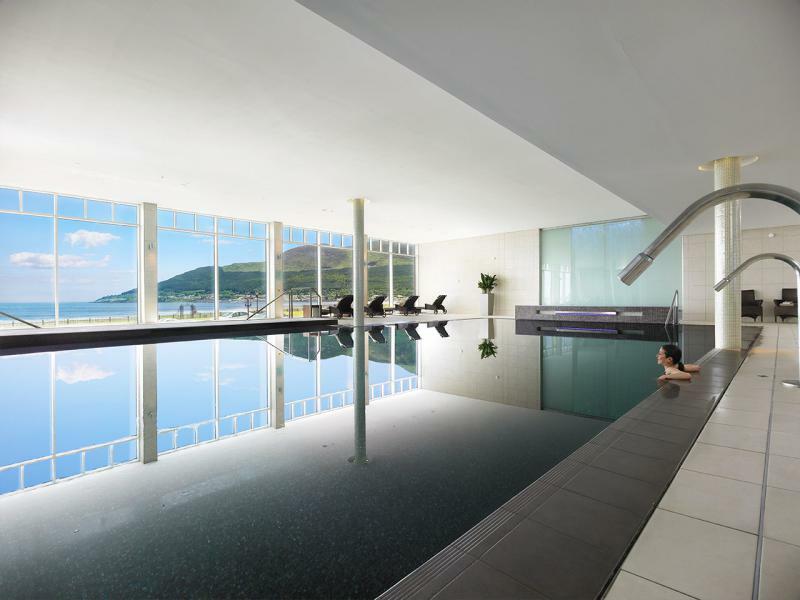 Hastings Hotels (hastingshotels.com, 028 9042 1066) offer nightly rates at The Slieve Donard Resort & Spa from £100 per person on a B&B basis.